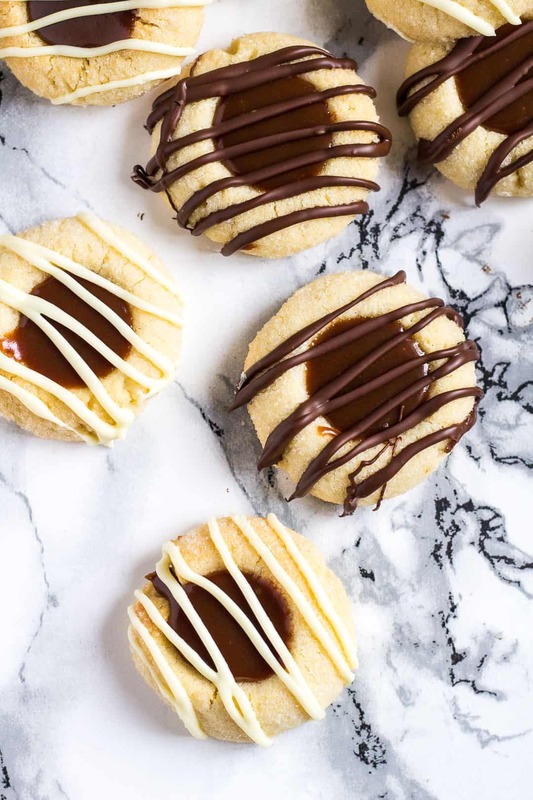 Chocolate Caramel Thumbprint Cookies – Deliciously soft, melt-in-your-mouth vanilla thumbprint cookies filled with homemade chocolate caramel sauce, and drizzled with melted chocolate! Have you had a chance to make my Salted Chocolate Caramel Sauce yet? Got any left over? 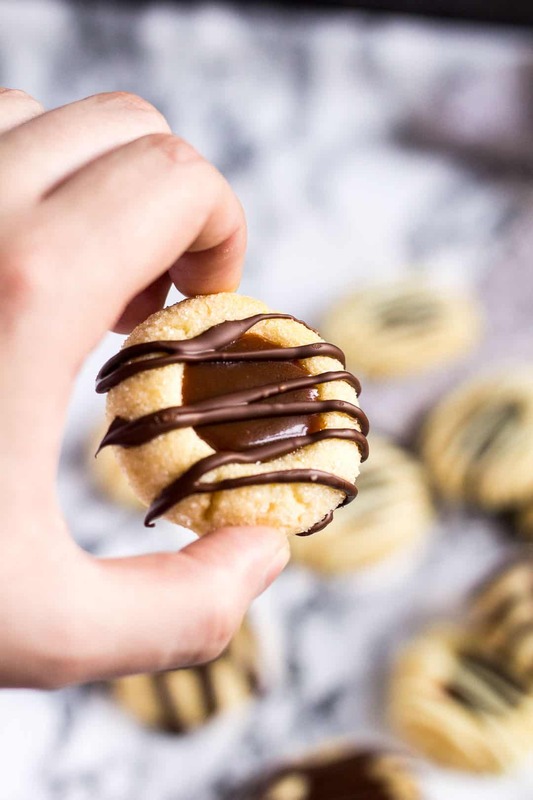 If so, I have the perfect recipe for you today – Chocolate Caramel Thumbprint Cookies! 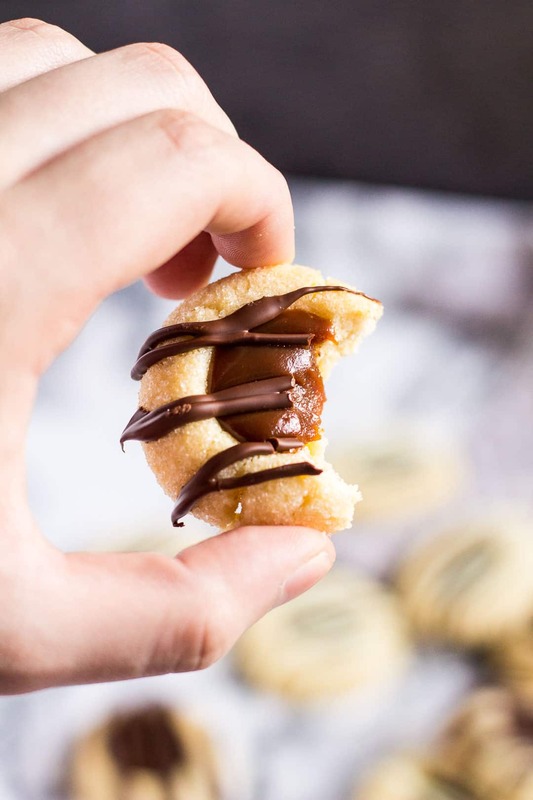 I used up my leftover chocolate caramel sauce for the filling for these incredibly soft thumbprint cookies, and it did not disappoint. These. Are. SO good. 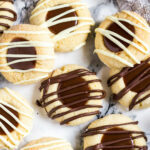 To make these thumbprint cookies, start by making the chocolate caramel sauce. Leave it to cool down as you make the cookies. Beat together the butter and sugar until light and fluffy. Add the egg yolk, and vanilla, and beat until combined. Add the melted white chocolate, and mix until combined. Add the flour, and salt, and mix to form a smooth, slightly sticky dough. Roll the dough into tablespoon-sized balls (about 0.7oz each). Roll each one in granulated sugar, and place onto a baking tray lined with parchment paper or silicone mat. Using your thumb, or the back of a measuring spoon (I used a 1/2 teaspoon measuring spoon), make an indent in the middle of each ball. Bake for 10 – 12 minutes until firm, and cracked around the edges. If the indents have risen, gently press them back down with the measuring spoon. Allow to cool for 5 minutes before transferring them to a wire rack to cool completely. Once cool, fill the indents with the chocolate caramel sauce. Place the cookies in the fridge to allow the filling to set. If desired, drizzle on some extra melted chocolate. These cookies are so quick and easy to throw together, and enjoy. The longest part about this recipe would be preparing the caramel filling beforehand – but even that’s easy! I usually like to make the chocolate caramel the night before, then store in the fridge ready to use the next day. The caramel can be stored in the fridge for up to 2 weeks, so you can definitely make it days in advance! 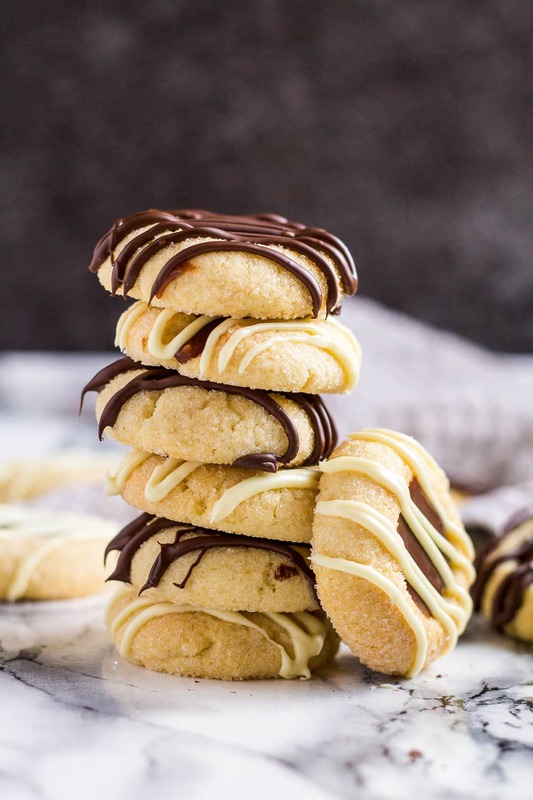 For looks, I topped these cookies with a drizzle of melted white and dark chocolate. You can top them with whatever you like, or leave them as they are. They’re delicious either way! Try these cookie recipes next! 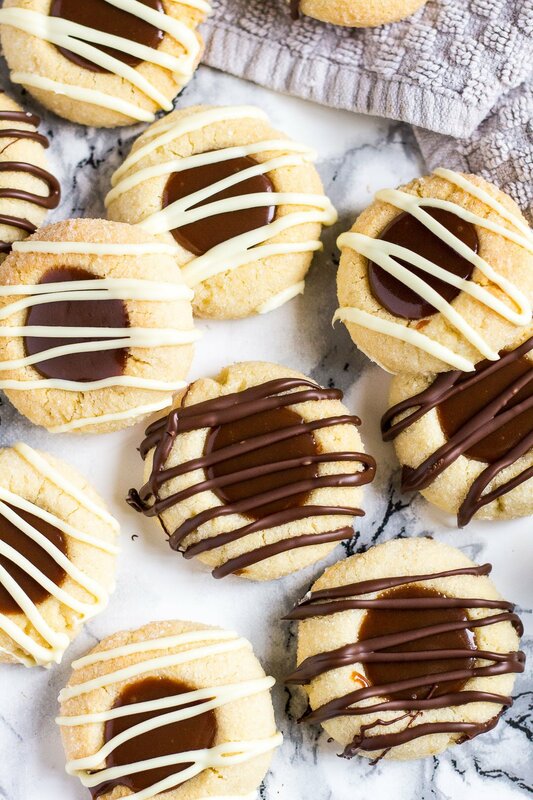 Deliciously soft, melt-in-your-mouth vanilla thumbprint cookies filled with homemade chocolate caramel sauce, and drizzled with melted chocolate! Make my Salted Chocolate Caramel Sauce, and allow to cool whilst making the cookies. This caramel will thicken as it cools, and when refrigerated. It can also be stored in the fridge for up to 2 weeks. Warm up to reach desired consistency before use. Preheat the oven to 180C/350F/Gas 4, and line a baking tray with parchment paper, or a silicone mat. Using a handheld or stand mixer fitted with the paddle attachment, beat the butter and sugar until light and fluffy. Add the egg yolk, and vanilla, and mix until combined. Add the melted chocolate, and mix until combined. Roll the dough into tablespoon-sized balls (about 0.7oz each). Roll each one in granulated sugar, and place on the prepared baking tray. Use your thumb, or the back of a measuring spoon (I used a 1/2 teaspoon measuring spoon), to make an indent in the middle of each ball. Bake for 10 - 12 minutes until slightly firm, and cracked around the edges. If the indents have risen, gently press them back down with the measuring spoon. Allow to cool for 5 minutes before transferring them to a wire rack to cool completely. 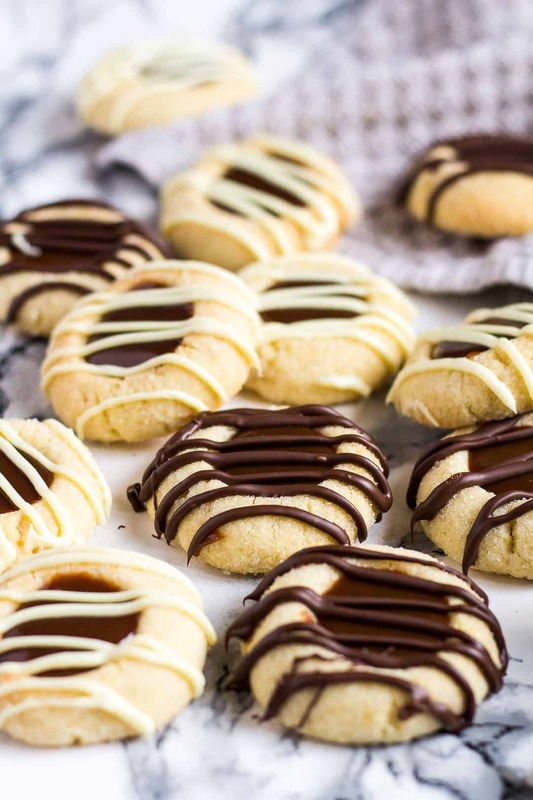 Fill the indents in the cookies with the chocolate caramel sauce. Place the cookies in the fridge to allow the filling to set. To speed up chilling time, place them in the freezer for 30 minutes. If desired, drizzle on some extra melted chocolate. Cookies stay fresh kept in an airtight container in the fridge for up to 1 week. They also freeze well for up to 3 months. Thaw overnight in the fridge before serving.